Ingredients and content: each 100mg include soybean isoflavone 1.96g ( isoflavoues aglycone 1.52g, daidzin 0.22g, genistein 0.23g, genistein glycosides 0.06g) vitamin E 128mg, vitamin c 2g. Attention: This product can not replace medicine and can not swallowing. 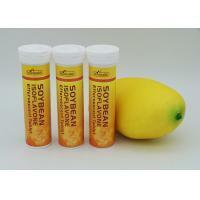 This product adds nutrients, when you eat with the similar nutrients, should not exceed the recommended amount. 5.Reliefing symptom of climacteric syndrome. and chemotherapy patients and people with gastrointestinal malfunction.The molecular weight is between 500~1000 dalton. 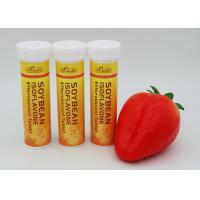 Soy Isoflavones are produced via a branch of the general phenylpropanoid pathway that produces flavonoid compounds in higher plants. 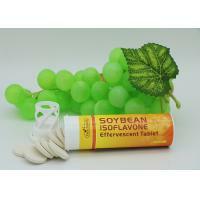 Soybeans are the most common source of isoflavones in human food; the major isoflavones in soybean are genistein and daidzein. converted into theisoflavone genistein by two legume-specific enzymes, isoflavone synthase, and a dehydratase. phytoalexin compounds to ward off disease-causing pathogenic fungi and other microbes. In addition, soybean uses isoflavones to stimulate soil-microbe rhizobium to form nitrogen-fixing root nodules. 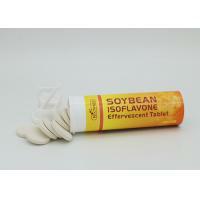 Soy Isoflavone can cure and restrain some cancers concerning hormone, such as prostate cancer, galactophore cancer etc..
Soy Isoflavone can prolong the anti-oxygenation time of low density albumen, its anti-oxygenation effect is the same with Vitamin E.
Soy Isoflavone is used in replacing therapeutics after menopause, and has no side effect. Soy Isoflavone has some equal effects with estrogen, can prevent osteoporosis caused by estrogen bone absorption sthenic.